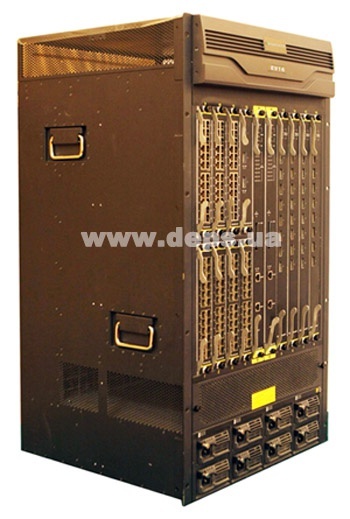 High-performance modular switch FoxGate E916 on the basis of the chassis with 20 line card slots. Can be equipped with two managed slots, 16 long business slots and 8 short bussiness slots. Also note that the work card, depending on network requirements, can be equipped with different numbers of ports. Switch FoxGate C708 has a redundant power supply, ventilation and managed modules. This ensures continuous operation and complete system redundancy. Line card hot-swappable capability makes it easy to swap defective line cards, shorten the network restoration time, and simplify troubleshooting. The rich functionality, high reliability and flexible management of the ports can be recommended to use this switch at the core of corporate and service provider networks, distributed LANs. FoxGate E916 supports up to 64 (8 * 8) 10-Gigabit ports or 384 (48 * 8) gigabit ports, thus providing flexibility and high port density. 10G modules can be used to connect to the L3 and L2 switches at the distribution level, which, in turn, prevents delays and packet loss. Master-slot automatically updates the firmware and configuration on the slave slot. Support for MPLS, MPLS-VPN and MPLS-TE allows you to send different traffic, such as IP-packets, SDH frames and Ethernet. RIP and OSPF provides dynamic routing, as well as exchange routes with other L3 switches or routers. High reliability, redundancy backbones (STP, RSTP, MSTP), routers (VRRP) and the organization of trunk for a quick recovery network performance after accidents on backbones. Support for MRPP (Multi-layer Ring Protection Protocol) provides a rapid recovery of channels at different levels. Unlike SPT, this protocol is faster in convergence, a simple calculation of the route, which improves the reliability of Ethernet networks. Supported protocols: DVMRP, PIM-DM/SM/SSM, IGMPv1/v2/v3, registration multicast VLANs, taking control of multicast streams, as well as the function of detecting illegal multicast source - all this provides an optimal and secure transmission of different types of multicast traffic in multi-networks. Multi-level means of traffic trunking - eight priority queues per port 802.1p, DiffServ, DSCP (Differntial Service Code Point field), traffic trunking and bandwidth limitations of applications and users on the level of IP-and MAC-addresses, TCP / UDP-ports ensure the timely delivery of mission-critical and multimedia data, regardless of level of network congestion. Developed means of ensuring network security and network protection - from the MAC-address filtering and VLAN to set access control lists (ACL) on the levels of L2/L3/L4. Flexible means to provide secure management and diagnostics: SNMP, Telnet, SSH, console port for LAN-management, the use of a set of commands similar to the equipment used in Cisco, the ability to mirror traffic from any port. 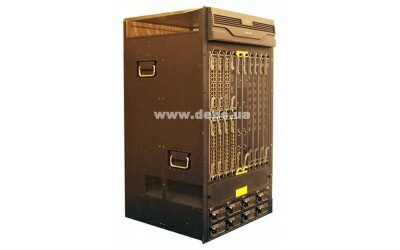 20 slot backbone switch with 2 long management cards or 4 short management cards. The switch can support max 16 short business cards and 8 long business cards or mixed cards. The switch can support AC+DC power supply to provide redundant. The chassis include 1 600W AC power supply as a standard configure. E900 management card - must configure at least 1. Select 2 cards construct the redundant environment.